Weight went up a little, but stayed in my target range (barely). My exercise was down a bit for the month (only averaging 2.25 miles/day of bicycling, down from 3.48 in July and from my normal year-round average of just over 4 miles/day). Non-Californians may find this strange, but I bicycle much more in winter (daily commute to campus) than in summer. It hasn’t helped that we had a heat wave at the end of August—I’m no longer used to afternoons with temperatures over 95°F (35°C), and I just stayed in my nice cool bedroom/office all day. I had really expected to lose some weight this month (despite the less-than-adequate exercise), because I had a colonoscopy in the first week of August. With 3.5 days of clear liquids only (about 400 Calories a day) and massive doses of laxatives, I expected my weight to plummet, needing some effort to bring back up. 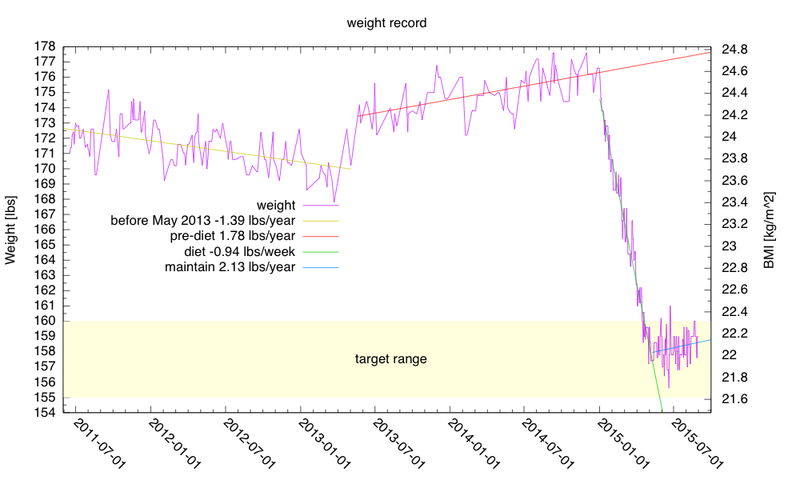 Look closely at that weight plot—do you see a drop at the beginning of August? Neither did I. Confounding my expectations, I put on weight during the colonoscopy prep—more liquid went in than came out. My experience should make it very clear that counting on laxatives for weight loss is a really bad idea. And despite the rather draconian prep protocol I followed, the gastroenterologist pronounced the prep merely adequate, which is still better than the last two times, when a more standard protocol resulted in inadequate prep. I have a very slow transit time (3–4 days, rather than the usual 1–2 days), so I need to customize the colonoscopy prep protocol. I customized the protocol this time, rather than following the standard one that the gastroenterology office wanted me to follow. Their protocols had failed twice already, because the protocols were based on an average individual, not customized for me. Discontinued nuts, whole grains, popcorn, fish oil, aspirin. Continued multivitamins, atorvastatin, and calcium carbonate. 00:00 Stop all alcohol, red, blue, or purple fluids. In five years, when I’m scheduled for the next colonoscopy, I’ll modify the protocol further, discontinuing solid food 12 hours earlier, replacing the Bisacodyl and Purelax with an earlier bottle of magnesium citrate (1 on day –3, 2 on day –2), and doing 3L of the PEG-3350 on Day –1 in 3 1L sessions (8:00, 12:00, 16:00), with only 1L early in the morning of the day of the procedure. I read a number of math-teacher blogs, even though I’ve not taught a math course since Spring 2003 (Honors Applied Discrete Math), because a lot of the teaching discussion is relevant to what I do teach. I also read some physics teacher blogs, for the same reason. It would be nice if there were blogs discussing precisely the same courses and teaching challenges that I face, but I don’t know if there is anyone else in the world who teaches the same eclectic mix of courses that I do. Last year I taught a first-year grad course on bioinformatics, a how-to-be-a-grad-student course, a freshman design seminar for bioengineers, a senior thesis writing course, a grad course on assembling the banana-slug genome (co-taught with another faculty member), and a lecture/lab course on applied electronics. Over the decades I’ve been a professor, I’ve created and taught courses on an even wider range than that, including bicycle transportation engineering, desktop publishing, VLSI design, technical writing, digital synthesis of music, and most of the core computer engineering courses. At the moment, I don’t see myself creating any more new courses before I retire, unless I can hand off some of the existing courses to younger faculty. The “better at questioning” theme of betterqs.wordpress.com is an interesting one for a teacher blog, as it focuses on one rather narrow aspect of teaching, but is open to a diversity of different subjects, different age ranges for the students, and different teaching styles. I’ve considered joining that blog as a contributor (it is open to any teacher, I believe), but I’m not sure how much I have to say about asking questions that is relevant to the math teachers who are the main audience. I have much less time with students than K–12 teachers do (35 hours for a standard course, 95 for my intense Applied Electronics lecture+lab course), so I don’t have the luxury of slowly developing a classroom culture—I fully expect some students to still be uncomfortable with the way I teach even at the end of the course, though I attempt to get them to buy into the main purposes of the course within the first few hours of class time. My goal in lecture classes is not to ask questions, but to get students to ask me questions—I’d rather that they figured out what they needed to know, rather than me trying to guess what holes they have based on what they get wrong on questions. I’m also not very interested in what students can do in 30 seconds—I want to know what they can do if they have adequate time to think and to look things up, so in-class questions don’t tell me much about what students need. I rely on week-long homework and papers to do that. I mainly use in-class questions to keep students engaged in the class—asking for the next step in a derivation, for example—rather than to test their knowledge or understanding. Since engagement is my goal, I don’t generally ask students who raise their hands, but do cold calling—selecting students randomly after asking the question. Questions in the lab are a different matter. There I’m either trying to understand what the student is attempting (“What is the corner frequency you were trying to get?”) or prompting them to learn to do debugging (“Where is your circuit schematic?” “Have you compared your wiring to your schematic?” “What voltage did you expect to see there?”). The successful candidate will be expected to establish a wet lab operation focused on stem cell genomics research, to develop a vigorous, externally funded research program, contribute significantly to undergraduate and graduate education, and perform university and professional service. We are defining stem-cell genomics fairly broadly, particularly the “genomics” part—the stem-cell part is an absolute requirement, as the available lab space is dedicated to stem-cell research. The “genomics” is there because that is where the department has critical mass—it will be easier to integrate a genomics person into the department than someone who is further afield. That said, we always look for the best available candidate using a broad definition of what the position calls for. Personally, I am hoping that we get someone in stem-cell engineering, as we are an engineering department, not an extension of the Molecular, Cell, and Developmental Biology department. I’m not on the search committee, though, and I don’t know whether they share my view of the importance of strengthening the engineering and design components of our curriculum and teaching—they may not even distinguish between science and engineering. This faculty slot is the last wet-lab person the department will be able to hire for some time (until the campus rationalizes their currently dysfunctional way of allocating space—we are desperately short of wet-lab space while other departments are trying to figure out what to do with all their unused wet-lab space), so we want to get someone good who’ll stay with us for a long time. It is an assistant-professor-only slot (tenure-track, but arriving with tenure)—the department has wasted way too much time on failed senior recruitments (generally forced on us by higher administrators—the School of Engineering has done much better growing our own faculty from promising assistant professor candidates). I moved the electrode chapter and electrode lab to just before the EKG lab. This makes more sense in terms of the flow of the course, and means that the electrode lab can be done during the shortened Memorial Day week. The microphone, loudspeaker, and first audio-amp lab are now closer together, making a more coherent cluster (the hysteresis lab is still between the loudspeaker lab and the audio-amp lab). Unfortunately, the change also means that the introduction to op amps gets squeezed a bit, as the first audio-amp lab is a week earlier. I’ll see how well that works this spring, and whether some other adjustment to the schedule is needed. 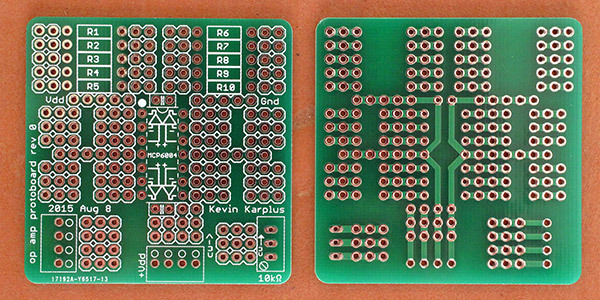 Front and back of op-amp protoboard. This board replaces the instrumentation-amp protoboard used in previous years. Students will solder two boards: a microphone preamp and an EKG. I think that the new protoboards will be easier for students to use than the old ones—the grouping of wires is more obvious, there are more dedicated resistor slots, and each resistor can now connect to two wires at each end. 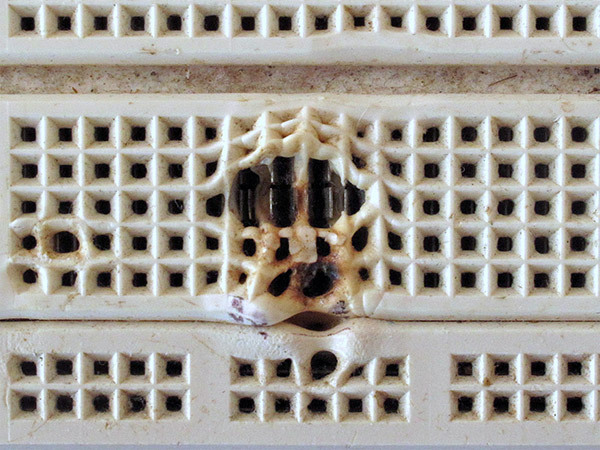 Too much current through a nFET can make it hotter than a bread board can handle. Throughout the book I changed references to the KL25Z board to references to the FRDM-KL25Z, as that seems to be the official part number for the development board. Work on the book and PteroDAQ will slow down somewhat for the next few weeks as I take care of other pressing deadlines: my teaching/research/service statement and biobib for a merit review—it’s been 4 years since the last time I did them; an external review for tenure of an assistant professor; final approval of PhD thesis that I read earlier this summer; finalizing the H. pylori genome assemblies I’ve been working on; setting up my web sites for fall quarter; planning the schedules for both my fall quarter classes; ophthalmologist appointment; training session for undergrad peer advisers; School of Engineering “all-hands” meeting; … . I’ve spent about 4–5 hours on the external review so far, and have only read the CV, research statement, and two of the papers—there are five more papers to read, so I figure it will take me about 10 more hours to read the remaining papers and synthesis a coherent 1–2-page letter supporting (or not) the tenure case. The thesis is a less difficult task, as I’ve already read the whole thing and marked it up—all I have to do is check that the corrections and clarifications I requested have been made. I expect that to take 4–8 hours. One problem is that both the tenure review and the thesis checking are tedious, so I can’t do them for very long at a time—but both are due next Wednesday. Writing the teaching/research/service statement will take some effort, as I have never been good at the bragging that seems to be expected—I tend to write honest statements of what I’ve been doing, which then get misinterpreted as my having been much less successful than what a straight reading of the material says.